Was born February 26, 1915 in Guadalajara, Jalisco died January 13, 2006 in Mexico, City. 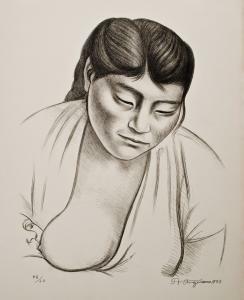 He studied art under Jose Vizcarra e Ixa Farias. He moved to Mexico City in 1934, He had his first solo exposition in 1936, some other historians argue his first solo was in 1935 at the Palacio de Bellas Artes, he was also a founder member of TGP, which he joined inmediately after its creation, and made his first litographies. He was secretary General of the Art Teachers Union, he was also member of LEAR, Revolutionary writers and Artist League in 1937, and was an artist collaborator at the Revolution School Center during the murals paitings. Anguiano travel outside Mexico very frequently his first trips were to Cuba, United States during 1938, 1940 and 1941. In 1948 he was founder member of the Society for the Improvment of the Fine arts. In 1949 he participated in an Expedition to BonampaK, and Lacandonan Jungle, organized by the National Institue of Fine Arts.With Jose Chavez Morales made a mural which was transported to Cuba during the Archtectural Congress in that country, in 1950. He presented a solo exposition in Paris in 1952, travel to Europe, and 1960 he presented his resignation to the TGP. Was consider one of the most beloved mexican artist. At his death a homage to his memory was presented at National Palace of the Fine arts, in Mexico City.